A seam is the most basic sewing construction for sewing two or more pieces of fabric together. As you learn to sew you will discover that almost all sewing patterns will refer to a set amount of seam allowance. It is important to sew accurate seam allowances so that all of the pieces will fit together. The seam allowance is the amount of fabric from the edge of the fabric to the stitching line. The most common set seam allowances are 1/4", 1/2" and 5/8". This means that the line of stitching will be a set distance from the edge of the fabric. The throat plate on your sewing machine usually has these guides built in or you can set your own seam guide. Always be sure the sewing machine needle is in the correct needle position for the stitching to be true to the stitching guide. For example, if you have the sewing machine needle in the far left sewing position, it will not be accurate if the needle should be in the center position. Eventually you are going to sew a curved seam. The parts of the seam are the same as if the seam were straight but the edge you will follow is curved. A crotch and arm hole seam are the most common curved seams that you will want to reinforce. No one wants a seam to let go when the bend over or reach so the simple solution is to reinforce these stress prone seams when you are constructing the item. Let's say that the set seam allowance is 5/8". You would sew the seam with the 5/8" seam allowance using a seam guide to be sure your seam allowance is accurate. Always watch the guide rather than the sewing machine needle for the best accuracy. Once the seam is sewn and you are happy with the stitching you have done, there are two ways to reinforce the seam. If you have multiple needle position settings on your sewing machine, leave your seam guide in place and simply move the sewing machine needle position one position to the right of the original seam line and follow the original seam guide. This creates a second seam line just to the right of the original seam and reinforces the original seam. Most basic sewing machines or older sewing machines do not offer gradual needle position settings. Left, right and center are the most common needle position settings. The best way to reinforce a curved seam without gradual needle position settings is to readjust your seam guide. 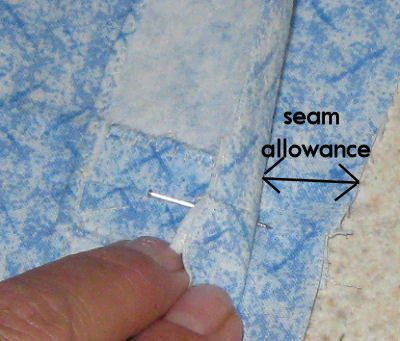 By adjusting your seam guide a scant or full 1/8" to the right, and guiding the edge of the fabric to that seam guide, you will be sewing just to the right of the original seam line and reinforcing the seam. If you've ever looked at a pair of jeans, you probably sew a flat felled seam. This seam encloses all raw edges forming a very strong and durable seam. Although this type of seam is most often found in denim jeans, it can be used in other places and will offer you the same strength and durability that it does in jeans. On flat felled seams, two rows of stitching is visible and there is no "unattached" seam allowance. A French seam is a seam which encloses the seam allowance, but is much more delicate than a flat felled seam. A French seam is a great seam to use on sheer, delicate fabric which is prone to fraying. A French seam is very similar to a regular seam with a seam allowance but the seam allowance is enclosed within the fabric. Because that raw edge is enclosed, the fraying is kept to a minimum. A French seam is also all straight stitching so even the most basic sewing machine can create this seam application and seam finish. Always align the fabric edges and pin or baste them in place. Always use seam guides for accurate seam allowances. Watch the seam guide rather than sewing moving sewing machine needles to sew straight accurate seam allowance.